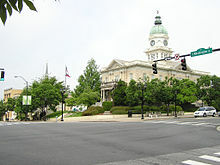 Athens, officially Athens–Clarke County, is a consolidated city–county and college town in the U.S. state of Georgia. Athens lies about 70 mi (113 km) northeast of downtown Atlanta, a Global City and the cultural and economic center of the Atlanta metropolitan area, being in the top ten of the largest metropolitan areas in the nation. It is a component of the larger Atlanta–Athens–Clarke County–Sandy Springs Combined Statistical Area, a trading area. The University of Georgia, the state's flagship public university and a R1 research institution, is in the city and contributed to its initial growth. In 1991, after a vote the preceding year, the original City of Athens abandoned its charter to form a unified government with Clarke County, referred to jointly as Athens–Clarke County. As of 2017[update], the U.S. Census Bureau's estimated population of the consolidated city-county (all of Clarke County except Winterville and a portion of Bogart) was 125,691; the entire county including Winterville and Bogart had a population of 127,064. Athens is the sixth-largest city in Georgia, and the principal city of the Athens metropolitan area, which had a 2017 estimated population of 209,271, according to the U.S. Census Bureau. The city is dominated by a pervasive student culture and music scene centered on downtown Athens, next to the University of Georgia's North Campus. Major music acts associated with Athens include numerous alternative rock bands such as R.E.M., the B-52's, Widespread Panic, and Neutral Milk Hotel. The city is also known as a recording site for such groups as the Atlanta-based Indigo Girls. In the late 18th century, a trading settlement on the banks of the Oconee River called Cedar Shoals stood where Athens is today. On January 27, 1785, the Georgia General Assembly granted a charter by Abraham Baldwin for the University of Georgia as the first state-supported university. Sixteen years later, in 1801, a committee from the university's board of trustees selected a site for the university on a hill above Cedar Shoals, in what was then Jackson County. On July 25, John Milledge, one of the trustees and later governor of Georgia, bought 633 acres (256 ha) from Daniel Easley and donated it to the university. Milledge named the surrounding area Athens after the city that was home to the Platonic Academy of Plato and Aristotle in Greece. The first buildings on the University of Georgia campus were made from logs. The town grew as lots adjacent to the college were sold to raise money for the additional construction of the school. By the time the first class graduated from the university in 1804, Athens consisted of three homes, three stores, and a few other buildings facing Front Street, now known as Broad Street. Completed in 1806 and named in honor of Benjamin Franklin, Franklin College was the first permanent structure of the University of Georgia and of the city of Athens. This brick building is now known as Old College. Athens officially became a town in December 1806 with a government made up of a three-member commission. The university and town continued to grow with cotton mills fueling the industrial and commercial development. Athens became known as the "Manchester of the South" after the city in England known for its mills. In 1833 a group of Athens businessmen led by James Camak, tired of their wagons getting stuck in the mud, built one of Georgia's first railroads, the Georgia, connecting Athens to Augusta by 1841, and to Marthasville (now Atlanta) by 1845. In the 1830s and 1840s, transportation developments and the growing influence of the University of Georgia made Athens one of the state's most important cities as the antebellum era neared the height of its development. The university essentially created a chain reaction of growth in the community which developed on its doorstep. During the American Civil War, Athens became a significant supply center when the New Orleans armory was relocated there to what is now called the Chicopee building. Fortifications can still be found along parts of the North Oconee River between College and Oconee St. In addition, Athens played a small part in the ill-fated Stoneman's Raid when a skirmish was fought on a site overlooking the Middle Oconee River near what is now the old Macon Highway. As in many southern towns, there is a Confederate memorial. It is on Broad Street, near the University of Georgia Arch. During Reconstruction, Athens continued to grow. The form of government changed to a mayor-council government with a new city charter on August 24, 1872, and Captain Henry was elected as the first mayor of Athens. Henry Beusse was instrumental in the city's rapid growth after the Civil War. After serving as mayor, he worked in the railroad industry and helped bring railroads to the region, creating growth in many of the surrounding communities. Freed slaves moved to the city, where many were attracted by the new centers for education such as the Freedmen's Bureau. This new population was served by three black newspapers: the Athens Blade, the Athens Clipper, and the Progressive Era. By its centennial in 1901, Athens was a much-changed city. A new city hall was completed in 1904. 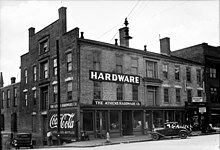 An African-American middle class and professional class grew around the corner of Washington and Hull Streets, known as the "Hot Corner", where the Morton Building was constructed in 1910. The theater at the Morton Building hosted movies and performances by black musicians such as Louis Armstrong, Cab Calloway, and Duke Ellington. In 1907 aviation pioneer Ben T. Epps became Georgia's first pilot on a hill outside town that would become the Athens-Ben Epps Airport. Athens got its first tall building in 1908 with the seven-story Southern Mutual Insurance Company building. In 1961, Athens witnessed part of the civil rights movement when Charlayne Hunter and Hamilton Holmes became the first two black students to enter the University of Georgia. Despite the Brown vs. Board of Education Supreme Court ruling in 1954, the Athens–Clarke County school district remained segregated until 1964. Clarke County formed (from part of Jackson County). 1806 - Town of Athens incorporated. 1808 - Georgia Express newspaper begins publication. Jackson Street Cemetery in use (approximate date). 1832 - Southern Banner newspaper in publication. 1834 - Camak House and T. R. R. Cobb House built (approximate date). 1841 - Railroad begins operating. 1842 - Joseph Henry Lumpkin House built. Benjamin H. Hill House built. 1859 - Lumpkin Law School and Lucy Cobb Institute (girls school) established. 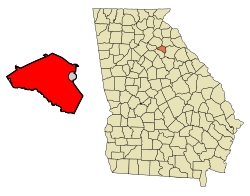 1871 - Athens becomes seat of Clarke County. State School of Agriculture and Mechanic Arts opens. 1882 - Gospel Pilgrim Cemetery established. 1895 - State Normal School opens. 1896 - Electric lighting introduced. 1903 - University of Georgia College of Pharmacy founded. 1904 - City Hall built. 1906 - School of Forestry founded. 1908 - Southern Mutual Insurance Company building constructed. 1910 - Morton Theatre in business. 1912 - School of Commerce founded. 1917 - Athens Ben Epps Airport opens. 1924 - Athens Country Club founded. 1928 - WTFI radio begins broadcasting. 1929 - University's Sanford Stadium opens. 1932 - University of Georgia begins administering previously separate colleges of agriculture, education, law, etc. University of Georgia Press established. 1948 - Georgia Museum of Art opens. 1949 - State Farmers Market established near Athens. 1954 - Prince Avenue Drive-In cinema in business. 1958 - Athens Area Vocational-Technical School founded. 1959 - Athens Historical Society organized. 1963 - Beechwood Shopping Center in business. 1965 - Daily News in publication. 1971 - Clarke Central High School opens. Athens Transit bus begins operating. The B-52's musical group formed. 1977 - Georgia Theatre in business. 1979 - Pylon musical group begins performing. Georgia Square Mall in business. 1987 - Athens-Clarke County Correctional Institution built. 1991 - Governments of Athens and Clarke County consolidate. 1992 - Athens-Clarke County Library's Heritage Room (for local history) established. 1996 - Part of 1996 Summer Olympics takes place in Athens. City-county website online (approximate date). Athens Institute for Contemporary Art founded. Athens Banner-Herald newspaper in publication. 2007 - Paul Broun becomes U.S. representative for Georgia's 10th congressional district. 2011 - Nancy Denson becomes mayor. 2015 - Jody Hice becomes U.S. representative for Georgia's 10th congressional district. Athens lies within the humid subtropical climate zone, with hot, humid summers and mild to moderately cold winters. Annual rainfall averages 49.7 inches (1,260 mm). Light to moderate snowfall can occur in winter. In the spring, frequent thunderstorms can sometimes become severe, even producing tornadoes. The city itself sits on a series of anomalous hills, unique to the Piedmont region. Athens has a humid subtropical climate. Its climatic regime is in many ways typical of Southeastern United States with long and hot summers transitioning into short and cool winters, but with precipitation being consistently high throughout the year. Normal monthly temperatures range from 43.5 °F (6.4 °C) in January to 80.6 °F (27.0 °C) in July; on average, maxima reach 90 °F (32 °C) or higher and stay below 40 °F (4 °C) on 58 and 5.8 days annually, and there are 48 days annually with a minimum at or below freezing. Official record temperatures range from −4 °F (−20 °C) on January 21, 1985 to 109 °F (43 °C) on June 29, 2012; the record cold daily maximum is 18 °F (−8 °C) on January 30, 1966, while, conversely, the record warm daily minimum is 79 °F (26 °C) as recently as August 11, 2007. Temperatures rarely fall below 10 °F (−12 °C), having last occurred January 7, 2014. The average window for freezing temperatures is November 5 to March 24, allowing a growing season of 225 days. Precipitation is relatively well spread (though the summer months are slightly wetter), and averages 46.3 inches (1,180 mm) annually, but has historically ranged from 28.61 in (727 mm) in 1954 to 71.39 in (1,813 mm) in 1964. Snowfall is sporadic, averaging 2.9 inches (7.4 cm) per winter, but has reached 13.6 inches (34.5 cm) in 2010–11. As of the census of 2010, there were 100,266 people, 39,239 households, and 19,344 families residing in the city. The population density was 851.5 people per square mile (328.8/km²). There were 41,633 housing units at an average density of 353.6 per square mile (136.5/km²). The racial makeup of the city was 64.71% White, 27.37% Black or African American, 0.21% Native American, 3.15% Asian, 0.04% Pacific Islander, 3.11% from other races, and 1.41% from two or more races. Hispanic or Latino of any race were 6.39% of the population. The large population increase from 1990 to 2000 reflects the altered boundaries that came with the consolidation of Athens and Clarke County, not just the influx of new residents. In the city, the population was spread out with 17.8% under the age of 18, 31.6% from 18 to 24, 27.3% from 25 to 44, 15.3% from 45 to 64, and 8.0% who were 65 years of age or older. The median age was 25 years. For every 100 females, there were 95.4 males. For every 100 females age 18 and over, there were 93.4 males. Judicial: Athens-Clarke County houses Magistrate, Juvenile, Municipal, Probate, State and Superior Courts. Superior Court covers the Western Judicial Circuit, which also includes Oconee County. Athens is home to a growing number of young technology companies including Docebo, Roundsphere, and Cogent Education. The city is also home to more established technology companies such as Partner Software, Peachtree Medical Billing, and Digital Insight. Athens is home to several pharmaceutical manufacturing and biotechnology companies such as Merial and Janssen Pharmaceuticals, Inc. The University of Georgia also hosts its own biotechnology research centers mostly from the lower east side of town bordering Oconee county. Each spring, there are bicycle races collectively known as the Twilight Series. One is the Athens Twilight Criterium. In 2010 the average household rent in Athens was $962. The national average was $1087. Of the Athens population 25 years of age or older, 39.3% have earned a bachelor's degree or higher. The Georgia Museum of Art at the University of Georgia has been, since 1982, the official state art museum. Culture coexists with the university students in creating an art scene, music scene and intellectual environment. The city has music venues, restaurants, bars, and coffee shops that cater to its creative climate. One of the remaining two double-barreled cannons produced during the American Civil War is here. St. Mary's Steeple, home of the First R.E.M. show and site for newly founded renovation. The Globe bar was voted by Esquire magazine as the third top bar in America in 2007. Founded in 1955, Allen's is Athens' oldest bar and grill despite closing in 2004, re-opening in 2007, and closing again in November 2011. Network Translations, Inc. developed here. It produced the PIX firewall which was later purchased by Cisco Systems. The music of Athens, Georgia, includes a wide variety of popular music and was an important part of the early evolution of alternative rock and new wave. The city is well known as the home of chart-topping bands like R.E.M. and The B-52s, and several long-time indie /rock hip-hop groups. The Athens music scene grew in the early 1970s and later during the 1980s with the Georgia Theatre and 40 Watt Club as the aforementioned bands scored breakout hits. Other notable bands were Widespread Panic, Dreams So Real, Indigo Girls, Vigilantes of Love, Matthew Sweet, The Method Actors, Love Tractor, Pylon, Flat Duo Jets, The Primates, Modern Skirts, The Whigs, and Corey Smith. National acts that have come out of Athens include: The Whigs, Reptar, Danger Mouse, Dreams So Real, alternative duo Jucifer, Servotron, Vic Chesnutt, Drive-By Truckers, Elf Power, Neutral Milk Hotel, Lera Lynn, The Sunshine Fix, Colt Ford, Velocirapture, Brantley Gilbert, Corey Smith, Harvey Milk, The Olivia Tremor Control, of Montreal, Widespread Panic, Perpetual Groove, Five Eight, Dead Confederate, Thayer Sarrano, Jet by Day, Mothers, and Athens Boys Choir. R.E.M. members Michael Stipe, Mike Mills and Peter Buck still maintain residences in Athens. The photo book, Athens Potluck, by Jason Thrasher documents the musical legacy of the town. Every summer since 1996 the city has hosted AthFest, a nonprofit music and arts festival in the downtown area. The Clarke County School District supports grades pre-school to grade twelve. The district consists of fourteen elementary schools, four middle schools, and three high schools (one non-traditional). The district has 791 full-time teachers and 11,457 students as of 2010[update]. The University of Georgia (UGA), the state's flagship public research university, is the oldest and 2nd largest institution of higher learning in Georgia. Founded in 1785, it was the first state-chartered university in the United States. Augusta University (AU) through its Medical College of Georgia has a Medical Partnership  with the University of Georgia housed at the University of Georgia Health Science Campus, and the AU College of Nursing has had a campus in Athens  since 1974. Athens is part of the Atlanta television market. Two Atlanta-market television stations, WGTV (channel 8) and WUVG (channel 34), are licensed to Athens. However their transmitters are in the Atlanta metropolitan area. WGTV broadcasts from the top of Stone Mountain. From 2009 until 2015, UGA operated a television station, WUGA-TV (formerly WNEG-TV) from studios on the UGA campus, but maintained its transmitter near Toccoa, its city of license; what is now WGTA has since moved its studios back to Toccoa after being sold by UGA. The 1940 film The Green Hand was shot in Athens, using local townspeople and students and faculty from the University of Georgia as its cast. The film had its premiere in Athens in January 1940, at an event attended by Governor Eurith D. Rivers. The movie Darius Goes West was shot in Athens. The 1980–81 ABC-TV television series Breaking Away (based on the 1979 film of the same name) was filmed in and around Athens, and made use of the university buildings, and local stone quarries for filming locations. In 2000, the fictional Ithaca University scenes in Road Trip were filmed on the North Campus of the University of Georgia. In 2009, a town, namely 'Rayford', which was loosely based on Athens, appeared in the video game Left 4 Dead 2. Also in 2012, The Spectacular Now was filmed entirely in Athens and the surrounding area. The city is the focus of U.S. Highways U.S. Route 29 (US 29), US 78, US 129, US 441, and Georgia State Route 72 (SR 72), and near the eastern terminus of SR 316 and the southern terminus of SR 106. Other state routes in Athens are SR 8 and SR 15, which follow US 29 and US 441 respectively, SR 10 which follows US 78 east and west of Athens but deviates to US 78 Bus. to go through Athens, and SR 15 Alt. which starts at the SR 10 Loop interchange at Milledge Avenue and follows Milledge and Prince Avenues to US 129 which it follows to the north. The SR 10 Loop serves as a limited-access perimeter. The city is bisected east to west by Broad Street/Atlanta Highway (US 78 Bus. and SR 10) and north to south by Milledge Avenue (SR 15 Alt.). Lumpkin Street, Prince Avenue (SR 15 Alt. ), North Avenue, and Oconee Street (US 78 Bus.) along with Broad Street are major thoroughfares radiating from downtown. College Station Road and Gaines School Road are major thoroughfares on the east side of Athens, along with US 78 east (Lexington Road). On the west side, most major thoroughfares intersect US 78 Bus. (Broad Street/Atlanta Highway), including Alps Road/Hawthorne Avenue, Epps Bridge Parkway, and Timothy Road/Mitchell Bridge Road. Athens-Ben Epps Airport (FAA code AHN) has been operational since 1917. It is east of downtown outside Georgia State Route 10 Loop and north of US Route 78. AHN qualifies for air service to be provided under the Essential Air Service provisions. SeaPort Airlines provides commercial air service to Nashville International Airport, TN. Until 2012, Georgia Skies and Wings Air provided commercial air service to Atlanta, and until 2008 (prior to either airline's current AHN service), US Airways provided service to Charlotte. Hartsfield-Jackson International Airport (ATL) is the primary point of departure and arrival for Athenians due to the relative lack of air service to AHN. Athens encourages use of alternative transportation. Bike lanes are provided on major thoroughfares. A rail-to-trail redevelopment is being considered to connect Downtown with the East Side. Organizations such as BikeAthens support and encourage biking. Skateboarding and small scooters are also common sights around UGA campus and Downtown. Athens Transit provides intracity transit seven days per week. UGA Campus Transit provides fare-free 24 hours/5 days a week transit around the University of Georgia campus, Milledge Avenue and Prince Avenue on the way to UGA's newest campus, the Health Sciences Campus. Southeastern Stages, a subsidiary of Greyhound Lines, provides intercity bus services. Low cost curbside bus service to Atlanta and Charlotte is also provided by Megabus. Athens has no direct passenger rail service; the closest Amtrak stations are in Atlanta, Gainesville, and Toccoa. Until the 1960s the Seaboard Air Line Railroad's daily Cotton Blossom, Washington - Atlanta, Silver Comet, New York - Birmingham and Tidewater, Norfolk - Birmingham service stopped in the SAL's Athens depot at College Avenue and Ware Street, north of downtown. Train service to Athens ended with the last run of the Silver Comet in 1969. Freight service is provided by CSX and Athens Line, the latter having leased tracks from Norfolk Southern. The Georgia Department of Transportation has proposed the city as the terminus of a commuter line that links Atlanta and Gwinnett County along the Georgia 316 corridor. Electric service in Athens-Clarke is provided by two customer-owned electric cooperatives, Walton EMC and Jackson EMC, as well as by Georgia Power, a subsidiary of Southern Company. Water utility is provided by the city. Garbage is provided by private companies according to customer purchase, though the city does offer municipal garbage pick up as a service. Natural gas is supplied by Atlanta Gas Light through various marketers within the deregulated market. ^ Holland, Maggie (May 22, 2018). "BREAKING: Kelly Girtz claims victory as Athens-Clarke County's next mayor". The Red & Black. ^ "Annual Estimates of the Resident Population: April 1, 2010 to July 1, 2016 – Metropolitan Statistical Area; and for Puerto Rico – 2016 Population Estimates". U.S. Census Bureau. Retrieved February 3, 2018. ^ "Statistical data" (PDF). census.gov. ^ "Unification of Athens & Clarke County". athensclarkecounty.com. Retrieved March 16, 2015. ^ "2017 U.S. Census Estimates–List of Metropolitan and Micropolitan Statistical Areas". U.S. Census Bureau. Retrieved June 17, 2018. ^ "Behind the Music in Athens, Georgia – Garden & Gun". Garden & Gun. November 13, 2017. Retrieved February 21, 2018. ^ Hynds, Ernest C. (1974; 2009 ed.). Antebellum Athens and Clarke County, Georgia, pp. 2-4. University of Georgia Press. ^ Hynds 1974, p. 9. ^ Stegeman, John F. (1964). These men she gave : Civil War diary of Athens, Georgia. Athens: University of Georgia Press. ISBN 9780820334585. Retrieved February 21, 2018. ^ Seibert, David. "The Stoneman Raid". GeorgiaInfo: an Online Georgia Almanac. Digital Library of Georgia. Retrieved November 9, 2016. ^ Thomas, Frances Taliaferro (2nd ed. 2009). A Portrait of Historic Athens and Clarke County, p. 293. University of Georgia Press. ^ Thomas 2009, pp. 115-17. ^ Doster, Emily Jean & Doster, Gary L. (2011). Athens, pp. 98-99. Arcadia Publishing. ^ Dyer, Thomas G. (1985).The University of Georgia: A Bicentennial History, 1785–1985, p. 329. University of Georgia Press. ^ a b c d Britannica 1910. ^ Scholl Center for American History and Culture. "Georgia: Individual County Chronologies". Atlas of Historical County Boundaries. Chicago: Newberry Library. Retrieved March 6, 2017. ^ a b c "US Newspaper Directory". Chronicling America. Washington DC: Library of Congress. Retrieved March 6, 2017. ^ a b c d e f g h i j k l m n o p "Historical Timeline: History of Athens-Clarke County". Athens-Clarke County Unified Government. Retrieved March 6, 2017. ^ a b c d "(Clarke County: Athens)". Explore Georgia's Historical Markers. Georgia Historical Society. Retrieved March 6, 2017. ^ a b c Federal Writers' Project 1940. ^ "Athens, Georgia". Encyclopedia of Southern Jewish Communities. Jackson, Mississippi: Goldring / Woldenberg Institute of Southern Jewish Life. Retrieved March 6, 2017. ^ a b "Movie Theaters in Athens, GA". CinemaTreasures.org. Los Angeles: Cinema Treasures LLC. Retrieved March 6, 2017. ^ John Companiotte (2016). History of Golf in Georgia. Charleston, SC: History Press. ISBN 978-1-62585-559-6. ^ a b American Association for State and Local History (2002). "Georgia: Athens". Directory of Historical Organizations in the United States and Canada (15th ed.). ISBN 0759100020. ^ "History of Society". Athens Historical Society. Retrieved March 5, 2017. ^ "Athensclarkecounty.com". Unified Government of Athens-Clarke County. Archived from the original on March 2, 2000 – via Internet Archive, Wayback Machine. ^ "Georgia". Official Congressional Directory. Washington, D.C.: Government Printing Office. 2009 – via HathiTrust. ^ "Athens-Clarke County, Georgia". State & County QuickFacts. U.S. Census Bureau. Retrieved March 5, 2017. ^ Civic Impulse, LLC. "Members of Congress". GovTrack. Washington DC. Retrieved March 6, 2017. ^ "Athens, Georgia Climate Summary". Weatherbase. Retrieved December 29, 2015. ^ a b c d e f g h "NowData - NOAA Online Weather Data". National Oceanic and Atmospheric Administration. Retrieved March 17, 2018. ^ "Station Name: GA ATHENS BEN EPPS AP". National Oceanic and Atmospheric Administration. Retrieved March 17, 2018. ^ "General Info About Athens-Clarke County". Athensclarkecounty.com. Archived from the original on September 24, 2010. Retrieved August 14, 2010. ^ "Population estimates, July 1, 2015, (V2015)". www.census.gov. Retrieved March 16, 2016. ^ "Best Bars – Esquire". Esquire.com. Retrieved October 29, 2011. ^ "Allen's Hamburgers announces it's closing". Retrieved July 12, 2013. ^ "Sandy Creek Park | Athens-Clarke County, GA - Official Website". sandycreekpark.com. Retrieved November 22, 2017. ^ Jason Thrasher, Athens Potluck, Deeds Publishing, 2017. ^ "AthFest - Music Arts Film & Kids Festival, Music Education, Athens, GA Half-Marathon". athfest.com. Retrieved March 16, 2015. ^ Georgia Board of Education[permanent dead link]. Retrieved July 23, 2010. ^ "Al Huda Islamic Center of Athens, Georgia". www.alhudaislamiccenterofathens.org. Retrieved November 22, 2017. ^ AU-UGA Medical Partnership Retrieved December 4, 2016. ^ AU-UGA Medical Partnership Health Science Campus Retrieved December 7, 2016. ^ AU CON Campuses Retrieved December 4, 2016. ^ Piedmont College- Athens Campus Archived July 17, 2010, at the Wayback Machine. Retrieved July 23, 2010. ^ "Piedmont At A Glance". Piedmont.edu. February 8, 2011. Archived from the original on July 20, 2011. Retrieved August 20, 2011. ^ Phil Hall (2009). The History of Independent Cinema. BearManor Media. p. 215. ISBN 1-59393-335-5. ^ "Road Trip (2000)". IMDb. Retrieved March 16, 2015. ^ "Athens sees itself in "Trouble with the Curve"". September 21, 2012. Retrieved July 12, 2013. ^ "Soaking up the spotlight". August 17, 2012. Retrieved July 12, 2013. ^ "Athens-Ben Epps Airport". Athensairport.net. Retrieved August 14, 2010. ^ "Home". Athens Transit. August 9, 2010. Archived from the original on August 27, 2010. Retrieved August 14, 2010. ^ "University of Georgia Campus Transit System". Transit.uga.edu. Retrieved August 14, 2010. ^ "Welcome Traveler, to SOUTHEASTERN STAGES, Inc. Providing Motorcoach Services Since 1933". Southeasternstages.com. Archived from the original on October 6, 2010. Retrieved August 14, 2010. ^ "The Athens Line". Railga.com. Retrieved August 14, 2010. ^ Hannan, Caryn (1999). Georgia Biographical Dictionary. State History Publications. p. 143. ^ "Jeff Daniels". IMDb. Retrieved March 16, 2015. ^ "Todd Grant Kimsey obituary". Athens Banner-Herald. September 23, 2016. Retrieved October 8, 2016. ^ "Major League Baseball – Brian McCann". Mlb.mlb.com. Retrieved October 29, 2011. ^ Fowler, Betty Alice (2009). "Lucy May Stanton (1875–1931)". New Georgia Encyclopedia. Retrieved March 25, 2013. John P. Campbell, ed. (1854). "Georgia: Clarke County". Southern Business Directory. Charleston, SC: Press of Walker & James. pp. 230+. Charles Morton Strahan (1893). Clarke County, Ga. and the City of Athens. C.P. Byrd, printer. Directory, City of Athens, Georgia. Athens Directory Company. 1909. "Negroes of Athens, Georgia". Bulletin of the University of Georgia. 14. 1913. Kenneth Coleman (2009) . Confederate Athens. University of Georgia Press. ISBN 978-0-8203-3438-7. Ernest C. Hynds (2009) . Antebellum Athens and Clarke County, Georgia. University of Georgia Press. ISBN 978-0-8203-3446-2. James K. Reap, Athens: A Pictorial History (Virginia Beach, Va.: Donning Communications, 1982). Conoly Hester; Albert L. Hester (1999). Athens, Georgia: Celebrating 200 Years at the Millennium. Montgomery, Ala.: Community Communications. ISBN 978-1-885352-28-6. Frances Taliaferro Thomas (2009). A Portrait of Historic Athens & Clarke County (2nd ed.). University of Georgia Press. ISBN 978-0-8203-3044-0. Dan Durning and Paula Sanford (2010). "Unification promises and outcomes: the case of Athens and Clarke County, Georgia". In Suzanne M. Leland; Kurt Thurmaier (eds.). City-County Consolidation: Promises Made, Promises Kept?. Georgetown University Press. ISBN 1-58901-622-X. Athens. Postcard History Series. Charleston, S.C.: Arcadia. 2011. Michael J. Gagnon (2012). Transition to an Industrial South: Athens, Georgia, 1830-1870. Louisiana State University Press. ISBN 978-0-8071-4510-4. Wikimedia Commons has media related to Athens, Georgia. Wikivoyage has a travel guide for Athens, Georgia. "Athens-Clarke County Guide: History". University of Georgia Libraries. Heritage Room. "Subject Guides: Athens". Athens-Clarke County Library.